Vietnamese Cuisine - A Small Sampling! Bánh cuốn is made from a thin, wide sheet of steamed fermented rice batter. The rice sheet in bánh cuốn is extremely thin and delicate. It is made by steaming a slightly fermented rice batter on a cloth that is stretched over a pot of boiling water. It’s then filled with a mixture of cooked seasoned ground pork, minced wood ear mushroom, and minced shallots. Sides for this dish usually consist of chả lụa (Vietnamese pork sausage) with the dipping sauce which is fish sauce called nước chấm. This is a great salad and easy to make. It simply includes peeled grapefruit, slide cooked shrimp and pork, mixed with nước chấm, which is a mixture of fish sauce, water, sugar, lime juice, garlic and grounded pepper. Cucumber, mint leaves, thin sliced carrot, and onions are also added for additional flavor and decoration. Alternately, pineapple can also be used instead of grapefruit. NỘM HOA CHUỐI is another popular Vietnamese salad. It’s thin sliced banana blossom leaves, mixed with thin sliced carrot, crushed roasted peanut, mint, and Vietnamese salad dressing, which is typically a mixture of fish sauce, water, sugar, lime juice, minced garlic, minced ginger, black pepper. If you’re craving something fresh and light, then this vibrant salad is just what you’re looking for. Julienned carrots, onions, and unripe mango are mixed with herbs like mint and basil before being marinated in a nuoc cham and lime–based sauce. The salad is then topped with either boiled shrimp or dried beef and decorated with a generous helping of fried shallots and roasted peanuts to add some crunch and depth to the plate. Marinated Red Tilapia (salt), steamed with sliced ginger, then steamed again with a mixture of soy sauce, water, and sugar. The way of steaming helps to keep all the flavor and nutrition of the fish. The dish can be sprinkled with fried garlic and green onion for additional flavor and decoration. Bánh xèo, literally "sizzling roll," is named for the loud sizzling sound it makes when the rice batter is poured into the hot skillet. A Vietnamese savory fried pancake made of rice flour, water, turmeric powder, it is stuffed with individual preferences, and served vegetarian or with meat. Some common stuffings include: pork, shrimp, diced green onion, mung bean, and bean sprouts. Bánh mì can refer to the bread itself but most of the time it implies a meat-filled sandwich. A bánh mì sandwich typically consists of one or more meats, accompanying vegetables, and condiments. Common fillings include steamed, pan-roasted or oven-roasted seasoned pork belly, Vietnamese sausage, grilled pork, grilled pork patties, spreadable pork liver pâté, pork floss, grilled chicken, chicken floss, canned sardines in tomato sauce, or soft pork meatballs in tomato sauce (xíu mại). Accompanying vegetables typically include fresh cucumber slices, cilantro (leaves of the coriander plant) and pickled carrots and white radishes in shredded form. Common condiments include spicy chili sauce, sliced chilis, or Maggi seasoning sauce. Phở is a Vietnamese soup consisting of broth, rice noodles called bánh phở, a few herbs, and meat, primarily made with either beef (phở bò) or chicken (phở gà). Pho is a popular food in Vietnam, which can be eaten for breakfast, lunch, or dinner. The broth for beef pho is generally made by simmering beef bones, oxtails, flank steak, charred onion, charred ginger and spices. For a more intense flavor, the bones may still have beef on them. Seasonings can include cinnamon or other kinds of cinnamon as alternatives, star anise, roasted ginger, roasted onion, black cardamom, coriander seed, fennel seed, and clove. The broth takes several hours to make. For chicken pho, only the meat and bones of the chicken are used in place of beef and beef bone. The remaining spices remain the same, but the charred ginger can be omitted, since its function in beef pho is to subdue the quite strong smell of beef. The spices, often wrapped in cheesecloth or a soaking bag to prevent them from floating all over the pot, usually contain cloves, star anise, coriander seed, fennel, cinnamon, black cardamom, ginger, and onion. Rau muống xào tỏi is a common dish for a home meal, or even in a restaurant. It’s easy to make as all you need to do is steam the vegetable (add a little salt to keep the greenness of the vegetable), then stir-fry the steamed vegetable with crushed garlic, and add a little fish sauce for flavor. Rice vermicelli ("bún") is a staple all over Vietnam. It comes with grilled pork sausage patties, a basket of herbs, bean sprouts, pickled veggies, and, once again, the ever-important nước chấm sauce (pour it over everything). Gỏi cuốn literally means "salad rolls" and should be distinguished from the fried rolls, which are also sometimes called spring rolls (or chả giò). The translucent cigar-shaped rolls are packed with greens, sometimes shrimp and/or pork, and herbs. They need a dunk in nước chấm of course. Almost every region in Vietnam has its own distinct spring roll but no matter where you are, the wrapping and rolling process is more or less the same. Clay pots are kind of like the Asian cousin of the Dutch oven. The thick clay walls retain heat and moisture, helping to soften and caramelize meats when braised. In this dish, the fish develops a sweet-savory gooeyness from the sugar and fish sauce over the course of the long braise. Cooking with dill is a uniquely northern Vietnamese thing. 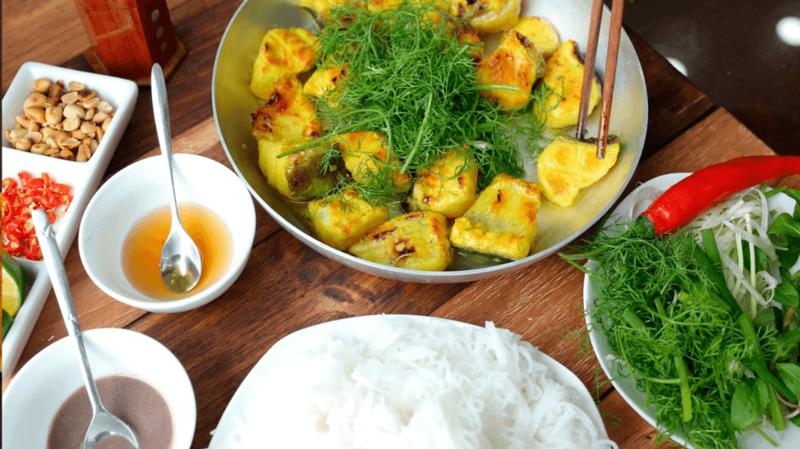 In this special Hanoi dish, flaky white fish is marinated in turmeric and galangal and served with generous amounts of dill. Dill is treated more like a vegetable than a garnish here. The fertilized duck embryo is matured for a few weeks then boiled. Tap the shell and inside you'll see the itty bitty creature's proto beak and webbed feet. Spoon up the baby bits with pickled garlic. Not a dish, but it's what accompanies just about every dish—this is the dipping sauce which we keep referring to. Sweet, spicy, sour, and fishy, it comes in a little bowl on practically every table, with every dish, every single day. It wouldn't be surprising if you consumed liters of nước chắm over the course of eight days in Vietnam. It's made with fish sauce (obviously), lime juice, sugar, garlic, chili peppers, and sometimes shredded carrot or lemongrass. At its simplest, cà phê đá is made using medium to coarse ground dark roast Vietnamese-grown coffee with a small metal Vietnamese drip filter (phin cà phê). After the hot water is added, the drip filter releases drops of hot coffee slowly into a cup. This finished cup of hot coffee is then quickly poured into a glass full of ice making the finished Vietnamese iced coffee. A popular way to drink Vietnamese coffee is cà phê sữa đá, which is Vietnamese iced coffee with sweetened condensed milk. This is done by filling up the coffee cup with 2-3 tablespoons or more of sweetened condensed milk prior to the drip filter process. Vietnamese "egg coffee" is technically a drink but we prefer to put it in the dessert category. 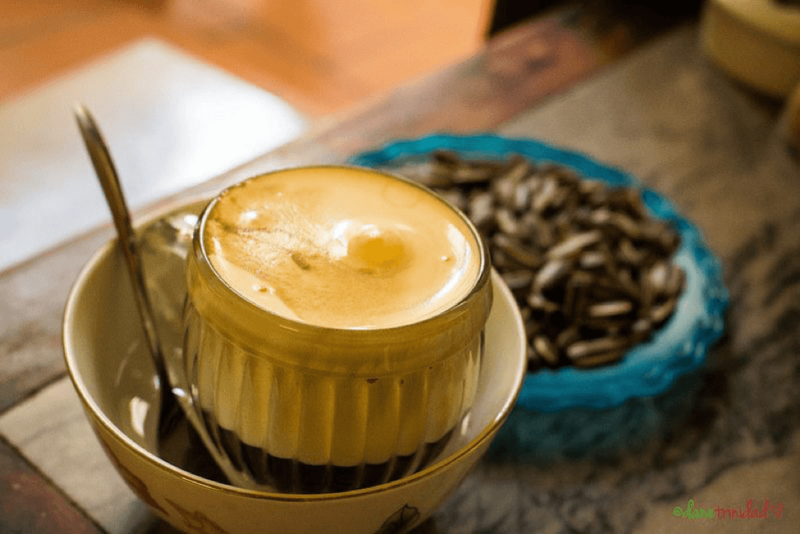 The creamy soft, meringue-like egg white foam perched on the dense Vietnamese coffee will have even those who don't normally crave a cup of joe licking their spoons with delight. Savory sticky rice is less of an accompaniment to meals in Vietnam, more a meal itself. The glutinous staple comes with any number of mix-ins (from slivers of chicken, or pork to fried or preserved eggs), but almost always with a scattering of dried shallots on top. Cubes of beef are tossed around a steaming wok with garlic, pepper, and some vegetables to make shaking beef. There's nothing special about the beef that makes it shaking. The name is just a literal translation that refers to the process of mixing the beef around while cooking. Eating this hodgepodge hotpot dish is a communal affair with everyone digging in to the oversized boiling pot. Just about anything can (and will) go into this soup, from tofu to frogs. It's best to stick to one main protein rather than opting for the mix of meat, poultry, and seafood together. There are a lot of vegetable included as well. The English translation of "tofu in tomato sauce" doesn't really do this dish justice. The slabs of deep-fried soy are doused in a rich fresh tomato and spring onion coating, and seasoned with a speckle of fresh herbs. This refreshing sweet and sour soup consists of a tamarind broth and is typically made with fish or clam, pineapple, tomatoes, and vegetables like okra and elephant ear. It’s somewhat evocative of tom yum, but without the lime and lemongrass. This dessert can be served in either a bowl or a glass. The latter is the more enticing option with the visible layers of bean jelly, coconut milk, fruit, and ice. Best had when you're craving something sweet on a hot day in Vietnam.